Many travellers say that the joy of flying has completely disappeared today, what with having to arrive at the airport at least two hours before your flight just to try to negotiate your way through security without having every item in your carry on gone through by someone in blue rubber gloves and all your little bottles thrown away. You then board a cramped plane, pay an arm and leg just for the privilege of putting a suitcase or two in the hold and have to take out a second mortgage for a sandwich and something to drink to keep the kids happy and quiet for the duration of the flight. Then once you get to your destination, there will be another long wait for your cases to arrive before standing in a long line for a taxi, before finally being able to make your way to your hotel or wherever you are staying. All in all you have wasted an entire day and you’re thoroughly exhausted! This is why more and more people are now deciding to pack up the car, say adios to the queues at the airport and use that day to drive to their destination which in turn also gives them a car without all the hassle of having to hire one. 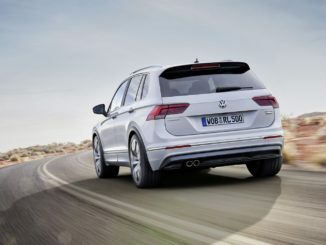 Whilst the Americans are used to taking road trips and have been doing so for years, because flying in the US is even less fun than flying in Europe, more and more Europeans are now taking to the open road and finding it a very liberating experience! I fact the first ever road trip by car apparently took place in Germany. With so much to see and do in Europe and many wonderful cultures and cuisines to enjoy, having a car and deciding on your own itinerary every day is the perfect way to explore The Continent. Bearing this in mind, YourParkingSpace has created the fun infographic with some of the best routes to explore in Europe including suggestions of what you can see and do in each place, from the Stelvio Pass in Italy to Route 500 in the beautiful Black Forest in Germany. 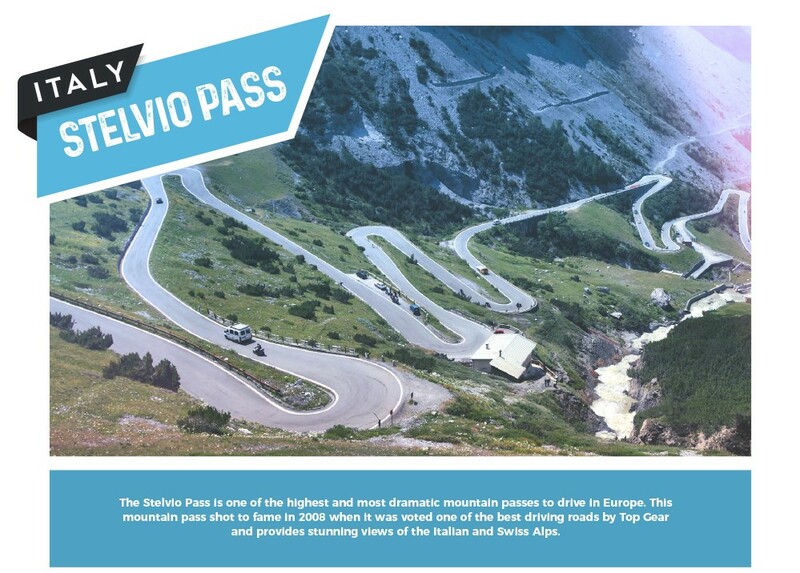 “The Stelvio Pass is one of the highest and most dramatic mountain passes to drive in Europe. This mountain pass shot to fame in 2008 when it was voted one of the best driving roads by Top Gear and provides stunning views of the Italian and Swiss Alps. Approaching the Stelvio Pass from the North-West side you get to drive up the Stelvio Pass’s renowned wall of 48 switchback turns. Each of the turns is numbered with stones so you can count your way to the top. Heading back down the pass towards Bormio provides several vantage points for photographs of this famous route. 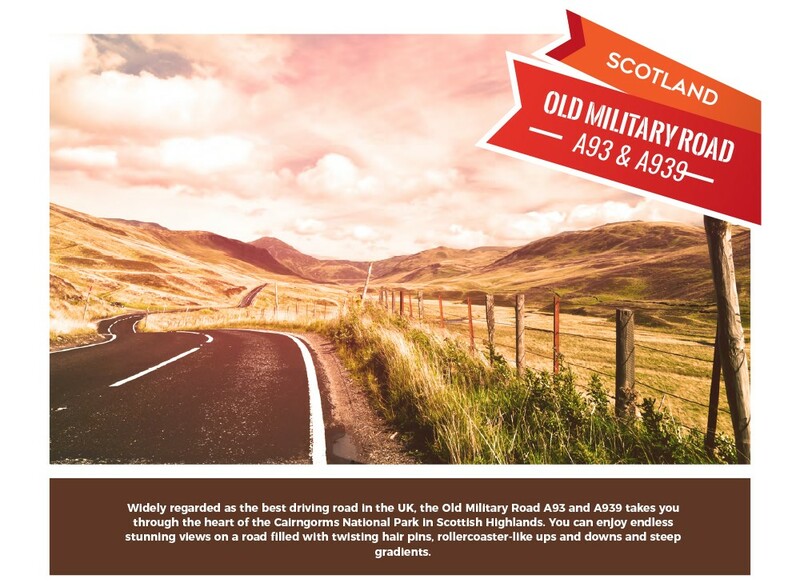 “Widely regarded as the best driving road in the UK, the Old Military Road A93 and A939 takes you through the heart of the Cairngorms National Park in Scottish Highlands. You can enjoy endless stunning views on a road filled with twisting hair pins, rollercoaster-like ups and downs and steep gradients. 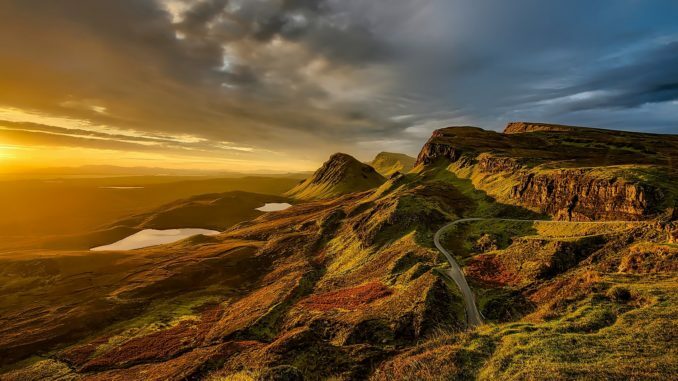 The route starts at Bridge of Cally, following the A93 into the Cairngorms National Park, driving through Braemar and past the Queen’s private residence Balmoral Castle. From there head onto the A939 for some more stunning highland views all the way to Grantown-on-Spey. 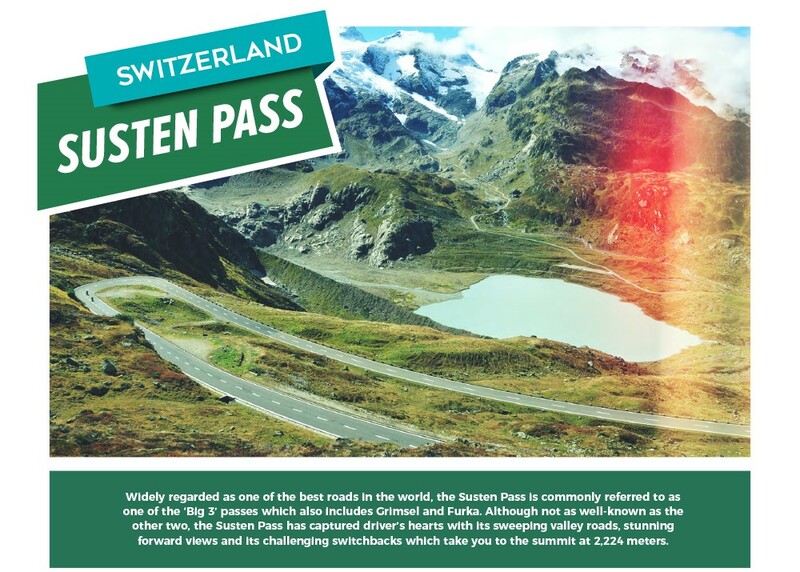 “Widely regarded as one of the best roads in the world, the Susten Pass is commonly referred to as one of the ‘Big 3’ passes which also includes Grimsel and Furka. Although not as well-known as the other two, the Susten Pass has captured driver’s hearts with its sweeping valley roads, stunning forward views and its challenging switchbacks which take you to the summit at 2,224 meters. The route starts in Wassen and finishes in Innertkirchen, and provides multiple places to stop and take in the spectacular mountain views. The road down to Innertkirchen takes you through forests and across fabulous stone bridges. 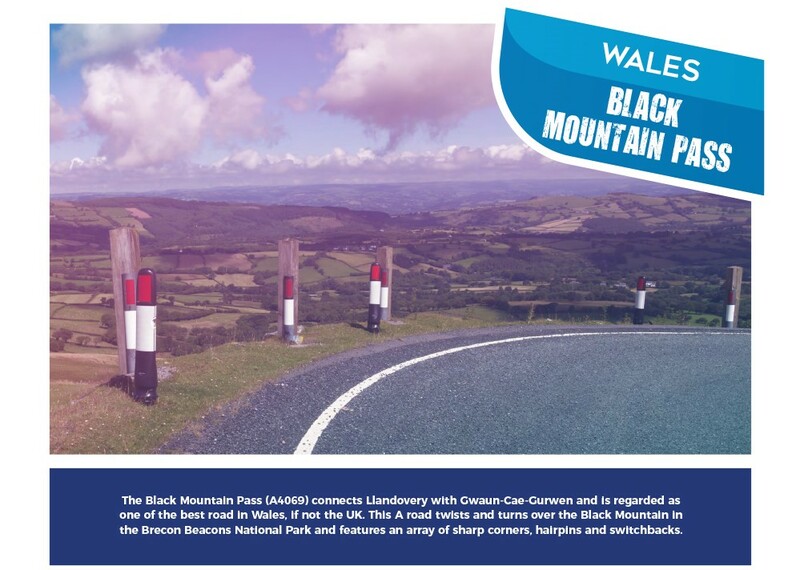 “The Black Mountain Pass (A4069) connects Llandovery with Gwaun-Cae-Gurwen and is regarded as one of the best road in Wales, if not the UK. This A road twists and turns over the Black Mountain in the Brecon Beacons National Park and features an array of sharp corners, hairpins and switchbacks. The route begins at Gwaun-Cae-Gurwen and joins the A4069 at Brynamman. The road then winds across and over the Black Mountain range and comes out near Llangadog before continuing onto Llandovery. 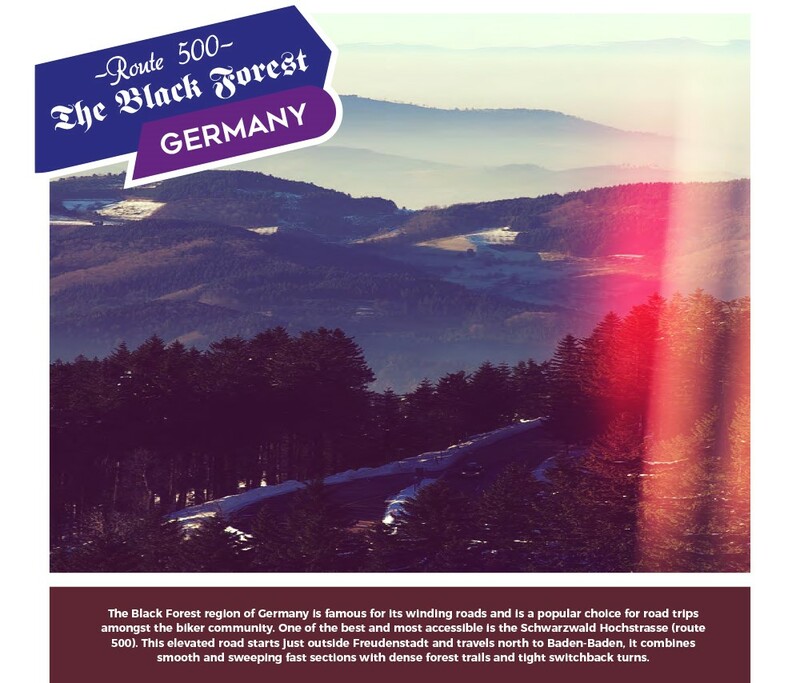 “The Black Forest region of Germany is famous for its winding roads and is a popular choice for road trips amongst the biker community. One of the best and most accessible is the Schwarzwald Hochstrasse (route 500). This elevated road starts just outside Freudenstadt and travels north to Baden-Baden, it combines smooth and sweeping fast sections with dense forest trails and tight switchback turns.